Since my overdue hiatus from being online (steemit) I've been trying to force myself to get back into the swing of things; I was looking for recent pictures I've taken of my fine feline furry friends who tend to give me countless adorable and cute pictures to choose from. I decided to pick this one photo of our kitty who we renamed Sara when we brought her home from a close family friend (who will be joining us here on steemit in the very near future and their name is smittenkittens. We ended up having to change her name because our friend had started calling her Puta because she wasn't friendly with any of the other cats she had in her house hold and she is pretty much the same exact way at our house and doesn't like our existing kitties. Sara does occasionally get along with one of our newer kittens which happens to be a male... they play together and it seems Sara tolerates him. Anyhow, back to me choosing this picture of Sara for #caturday. I happened to take the picture one night while watching Shameless and I couldn't help but save it and now I know why I decided to take it and keep it because it's perfect for this post here! Sara does like to sleep a lot and I'm quite sure that it's apparent here in this post. Let me know what you think of the picture and if it's not one of the most adorable sleepy kitty pictures. While I am at it I will throw in a few factoids about Sara so it's not totally a boring post and after reading it who knows you might just learn something. Sara is what a lot of people would call a tortoiseshell cat and sadly they are not a unique breed but their coloring is certainly one of the most intriguing options out there. Tortoiseshell cats have a combinations of two colours that are usually black and red. There are many variations of the black and red and then the black can be diluted variations of gray or brown and the red can be diluted to cream, orange and gold. Torties are called tortoiseshell because of the coloring of their coats that resemble a tortoiseshell turtle. Tortoiseshell cats are predominantly female; but occasionally you will find a male and they are considered very rare. When there is a male tortoiseshell cat they most likely will be sterile. Here is a interesting factoid I found on the internet I thought I'd share here: "White Tortoiseshells are the official cat of Maryland! The calico or white tortoiseshell cat is the official cat of Maryland. The state cat became official on October 1, 2001. The feline shares the same color pattern as the oriole, the state’s official bird, so the calico was the obvious choice. Some people think Tortoiseshell cats are lucky! 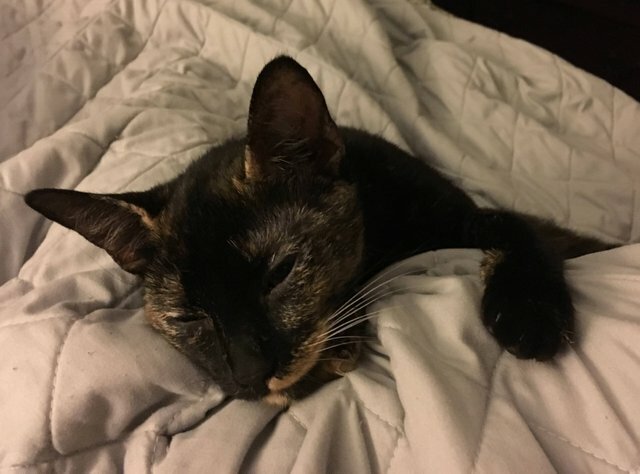 It's believed in some older folklore that torties bring good luck. There is a few areas in the United States where they are referred to money cats. In the Japanese culture they are believed to ward of evil spirits and ghosts not to mention viewed as downright mystical. In fact, the people of Japan sometimes kept these cats on their boats to keep themselves safe from harm while on the water. I could keep on listing more facts and reasons on why torties are so cool but I think I should save that for another post. Until then check back and if you want check out the link I included in my post to learn a few things about this wonderful type of cat I've came across and invited into my life. I promise more pictures are on the way! Wow... that is definitely the most adorable cat photo I have seen in a very look time! I'll have to keep an eye out for your smittenkittens project.